The song mode has been designed to be a practical, fast and handy tool for creating your songs structure. The song list is located at the left side and the song parts are in the right. Tap the last component on the list with the blue + to add songs. Set the song name, BPM (beats per minute) and soundset for the song. Doble tap on the song to edit name, bpm or soundset. Long press on a song and move to relocate the song position. Double tap to edit the song and tap "Delete" button. Tap the last component on the song part list with the blue + to add parts. Set the rhythm in the new popup window. The bank list makes easier the search for rhythms. Set the improvising level with the "Jam Intensity" slider, the number of bars and put / quit fill to end the part. 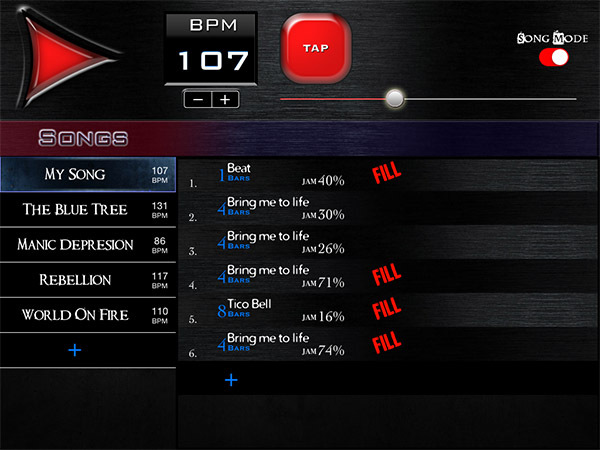 Doble tap on the song part to edit any parameter. Long press on a song part and move to relocate the part position. Double tap to edit the part and tap "Delete" button. Select the part to duplicate and press + to add part. All the parameters for the new parts are exactly as the selected. A useful way to add parts is to go out from the Song Mode and choose rhythm and jamming level. When you return to the song mode and tap directly to + (add part), the chosed parameter will be exactly as played.